Club Penguin Cheats by Mimo777 Club Penguin Cheats by Mimo777: Club Penguin Jammin News! The Music Jam is still going strong and will be here until July 18th! 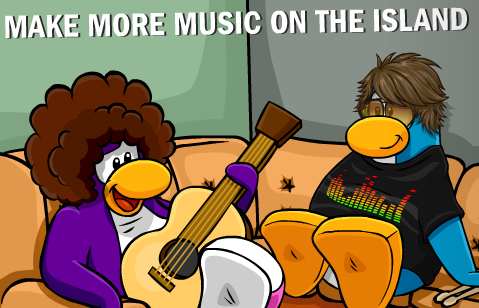 But, after the Music Jam is over, we can continue jamming in our iggies. Not only that, but starting July 19th, the Lighthouse will have a Catalog! Sweet! If you head to the Back Stage you can check out the new Music Catalog! So, what "all" starts July 26th? It must be the new stamps/stickers, huh? Let me know what you think! I reckon the advertisement is for an upcoming water/summer party. That would be awesome. this can be a water party! PS i like the other instruments! I think on July 26th that they r going to start a new party...maybe this one has to do with the beach? Everything has been coming early. I mean it's wednesday and thursday items are out...it must be thursday in Canada? Hmmm I dunno, maybe they are now contributing for people down on the other side of the world I dunno everything's coming early. I dont play CP much anymore but I still check it out every so often and they are doing things early in the US. 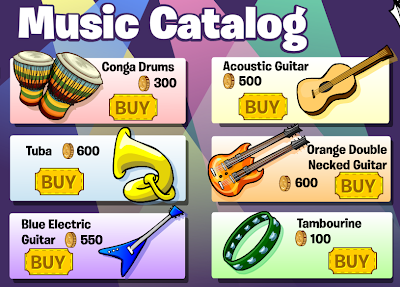 The igloo catalog is there right now! Its pretty cool. Theres amps and drums and other stuff! I reckon something about surfing. Maybe a new surfing level! lol its not thursday here in canada it's wednesday not thursday...china is 1 day apart from canada...not U.S... anyways that was a reply to Skittlez Productions so plz post this and also the ad... i think its for stamps because i think thats also one of the new stamps for the surfing game! Maybe a summer party? You remember the Herbert Statue from the DS game? At the end, when the hole was plugged up they had a water party. Maybe the advertisment is saying when the stamps/badges start. You know that the surfer is in the Game Catchin' Waves, and lots of the 'coming soon' stuff Billybob gave us comes from the games. So my theory is that they will start the stamp/badge thing they are doing next week. What do ya think Mimo? (I hope I make sense). Well, it does say like thats when things start or something so it could be like a clubpenguin madness haha. i think it is a water party, because he's on a surfboard. it was a little while since the ds game was released with the flood. I hope so! mimo i know tht july 26 is the day Maldives gained independence from the portugese or british i dont remember btw am from Maldives! I Think That 'All' Means That Every Single Catalog Will Be New, Every Minigame Will Be Updated, There Will Be An Update In Missions, A New Field Op, A Brand New Party, Never-seen-Before Stuff. You Know Everything New. Also It Could Be That When Disney Bought Club penguin It Was Like A New Start So They Are Possibly Selling It. But Why Would They Do That? oh mabey they will finally let non members buy close and once its over they cant buy anymore. 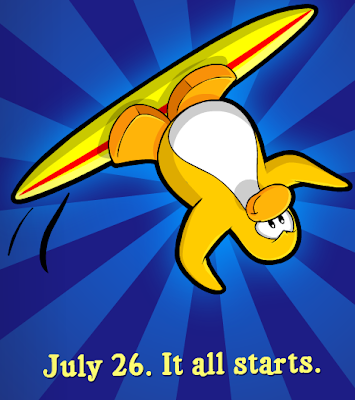 I doubt there's going to be a Surfing Contest xD On July 26th the "stamps" are probably coming out. The Jam will end on Sunday where I live but for some people it may end later on in the day on Saturday. I agree, if Club Penguin keeps bringing back "rare" items, eventually nothing will be rare. I think it has to do with the mysterious "stamps". I think on the 26th we will be able to start collecting the "stamps". Thats's a really good prediction! Yeah, I've been thinking the same thing! but what about the colour voting and the Festival Of Flight and The water party are all these the surprise which CP said ? I chatted with a couple of test penguins today (Screenhog and Billybob) and they claim it is going to be the return of the water party! IM SO EXCITED I CANT FEEL MY LEGS!!!! I just hope they give back rare items...like the green sunglasses and the blue lei, but instead make the red lei a comeback! 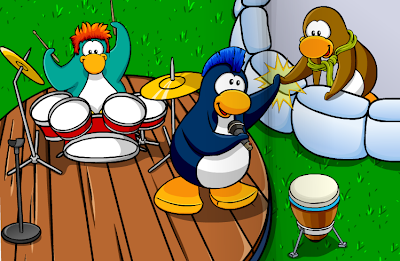 anyways, the screenhog and billybob tests said that it is the water party returning to CP! HEY MY B DAY IS JULY 26!!!! July 26. Maybe a water party. Lol. Same. Water party. You need water to surf! G'day from Australia! I miss the water party! Umm... 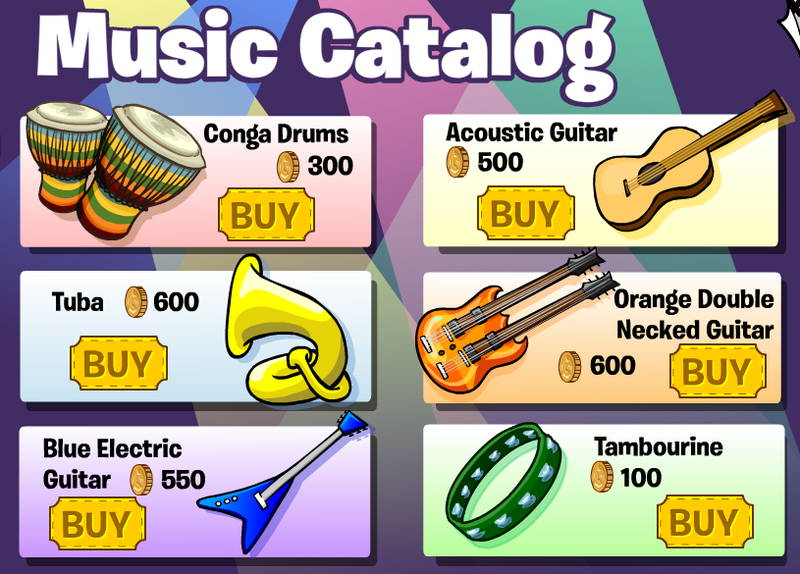 I got the acoustic guitar in January as a hidden item, so it was never "antique" as you call it. Maybe it will be a surfing contest, or summer surprise party! Or maybe a new play at the stage! @ Annonymous Its not something to do with the beach but good guess!